As part of the Lytham Sport Festival I am putting on a Come-and-try-Orienteering event in the grounds of Lytham Hall on Saturday 27th August. The event will consist of three courses: white, yellow and orange and start times will be from 10:30 to 15:30. Five events and five sunny Tuesday evenings. Thanks to all 86 competitors for coming to the Sprint series and to the Organiser's - Stewart, Mike, Julian, Sarah (and myself) for putting on challenging / enjoyable sprint courses. The mixture of urban, country park and university/college grounds certainly provided us with a wide range of terrains and a variety of mental and physical challenges. Myerscough was the only venue where all controls were correctly visited by all competitors. Thanks also to Chris, Bob and Mike for providing the computing support . Well done to the Series winners - Jane, Luigi, Helen, Finlay, Anna and Mike. 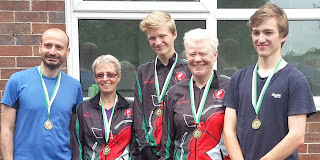 The last event in the SROC Summer Sprint Series was a suitable challenge around the newly extended map of Myerscough College. After two hard fought races the league totals were totted up and prizes awarded to the worthy winners in each age category. Results for this and all the series are linked from the series page. Final league tables and conformation of class winners will be posted when available. SROC NW Sprint Champions at Offerton on Saturday. From left: Luigi Lerose, Jane Anthony, Finlay Johnson, Miriam Rosen & Laurence Johnson. Don't miss the final SROC sprint event of the current series, today, at Myerscough. The fifth and final event in the 2016 SROC Summer Sprint Series is just a few days away! This will be at Myerscough College on Tuesday 12th July, using an updated and extended map. There will be the usual two stages of Prologue and reverse-order start Final, each a proper sprint race in itself and with total times combined to establish your position. Soon after the last finisher there will be the series prize giving so don't miss this last chance to improve your league position. Click here for details of the Myerscough event, and current league standings after four events are here. Results for yesterday's sprint series event are linked from the series page. RouteGadget is also available.